DER growth can be a blessing or a curse. New software platforms can help with preparation. New solutions are emerging for one of the biggest challenges posed by distributed energy resources (DERs). DERs like customer-sited solar, batteries and electric vehicle chargers, hold the promise of revolutionizing the power system, allowing customers to take greater control of their electricity usage and potentially replacing some traditional grid infrastructure. That’s a sea change for an industry that, for a century, faced little competition and relied on massive, customer-financed grid investments to provide electricity. But to take advantage of the new DERs, utilities need to first know how to plan for them. If they do not, customer adoption could outpace utility preparations, leaving power companies with declining revenues and new operational issues on the distribution grid. For many U.S. utilities, the threat is real and growing. Between 2018 and 2022, U.S. distributed solar installations will grow from today’s roughly 2.0 million to almost 3.8 million, according to GTM Research. Behind-the-meter battery storage is forecast to grow in that period from around 200 MW to nearly 1,400 MW. And EVs will go from today's 1% of new car sales to over 50% by 2035, Energy Innovation reckons. 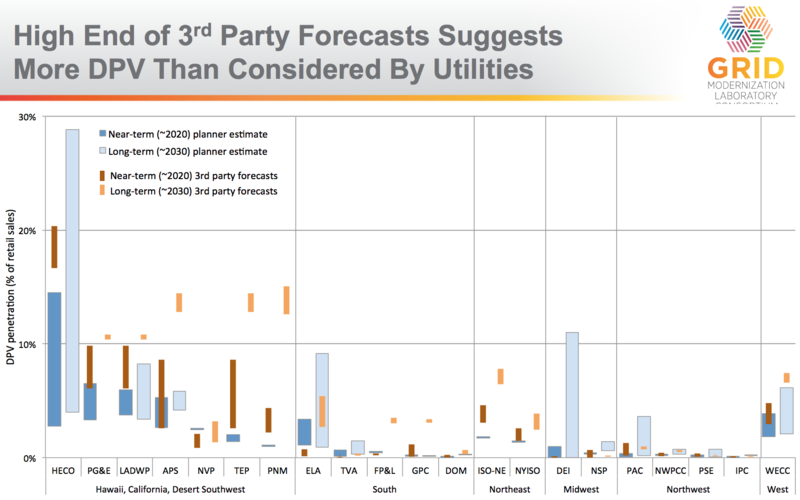 Few utilities are seeing DER penetrations today that threaten reliability or revenues. But most are beginning to prepare, entering regulatory discussions about grid modernization, DER compensation and other associated issues. Even Duke Energy, which has relatively low DER penetrations today, is planning for its future growth. "We will need more dynamic solutions as penetrations rise, though customer adoption rates are not yet clear," said Rudy Bombien, DER planning and forecasting lead. "But Duke Florida customers are adding 300 solar systems per month, which suggests a coming need for more granular forecasting." Newly emerging software tools can help utilities get ahead of DER adoption, forecasting not just customer adoption, but financial and operational impacts of the new resources. As utilities push into the distributed energy future, tools like these are likely to be crucial to maintaining the reliability and affordability of electric power. Adoption of resources like distributed PV solar (DPV) could happen faster than utility planners currently expect, making the need for forecasting tools more pressing. Emerging distribution analysis platforms "more fully evaluate the impacts and benefits of [rooftop solar] and other DER," according to a recent study of distribution system planning from Lawrence Berkeley National Laboratory (LBNL). Keys to the most accurate and complete analysis are "automated planning steps, advanced algorithms, and high-performance cloud computing," it added. Accurately including DER into utility load forecasts can lead to a more precise understanding of their costs and benefits, LBNL Research Scientist Andrew Mills told Utility Dive. That would lead to better utility investments, like non-wires alternatives (NWAs) to replace or augment aging distribution system infrastructure. A recent study of the Pacific Gas and Electric (PG&E) system in California found that DER-based NWAs would be unlikely to economically defer utility expenditures on "about 90% of feeders," Mills said. "In around 10% of feeders, there is some potential," he added. "And, in a few, the potential economic value of deferring is high. But it is very site-specific." Most distribution system planning is not site-specific today. Modeling is based on historical patterns of DER adoption or goals set for utilities. Those models are "commonly used, easy to implement, and rely on few or no quantifiable predictive factors, but may not be sufficiently robust for planning," according to a Department of Energy (DOE) study. This is called top-down modeling, Mills said. "They forecast the DER expected on the entire system and use some mechanism for allocating that down to particular locations." Less used are bottom-up modeling systems that begin with factors that impact customers' DER adoption decisions. Among them are DER cost and performance, incentives, customer retail rates, peer-effects, and customer demographics. This is customer adoption modeling, Mills said, and the best approach may be combining the two. But, he added, few utilities do distribution system planning today, and "very few of those include customer adoption modeling." The newest bottom-up and hybrid approaches to planning include customer adoption modeling and are done with automated, cloud-based software. They allow faster, more comprehensive, dynamic, and repeatable forecasts "across multiple scenarios with varying assumptions," DOE reported. "Traditional utility planning was done with 20-year to 30-year forecasting and decisions were implemented over as much as five years," Mills said. "The rapidly rising penetrations of DER requires making distribution system planning decisions more quickly. Getting more information into that decision-making process probably needs to be done sooner rather than later." Among the innovative uses of dynamic customer adoption modeling is recognizing how a customer's "propensity to adopt" one DER technology impacts the adoption of others, Mills said. "Most DER forecasting treats those choices as independent. But how much more likely is somebody who has done PV to do EV or a water heater pump or something else? And how does that affect future load?" New cloud-based DER forecasting software can estimate the potential for DERs, customer adoption rates and impacts on utility revenues and operations. An Integral Analytics (IA) tool used by Pacific Gas and Electric (PG&E) and a GridUnity tool used by Southern California Edison (SCE) are among the leaders in dynamic DER forecasting. Newly emerging platforms, like ProsumerGrid and WattPlan Grid developed by Clean Power Research with the Sacramento Municipal Utility District (SMUD), offer many of the same features and other, more advanced ones. IA President Kevin Cushman told Utility Dive its LoadSEER software begins with load forecasting and assimilating system and customer information to understand how DERs will impact load growth. With adequate data, it is capable of identifying what impact each customer’s choices will have "at that section of the grid, at hourly intervals, all the way down to the meter level." IA CTO Tom Osterhaus added that the tool "can actually go below the meter to the end use." It can incorporate and use data from HVAC, water heating, and solar systems and, in some cases, go below hourly intervals," he said. Customer adoption modeling is "an implicit part of what we do, and has been for five years," Osterhaus said. "But it is more than modeling adoption of demand response, energy efficiency, storage, solar, and EVs. It is aligning the covariances on uncertainty, like weather or where EVs might be on the system." Risk to the grid grows with generation and load nuance, Osterhaus added. While no long-term forecast is perfect, but every forecast adds value. "LoadSEER is designed to accommodate nuance and make the what-ifs in repeated scenario runs more accurate," he said. Cushman said LoadSEER maps and forecasts for over 100 intrinsic and extrinsic econometric variables. "We have the ability to shape or impact our DER adoption forecast through agent-based modeling," he said. "The agents are things as different as the growth of EV charging stations and DER policy and the pricing and availability of different DERs." Osterhaus added that changes in things like pricing are fed back into DER forecasting to further optimize outcomes. "LoadSEER is delivered to the utility as a software application, and not a static study," he said. "It is constantly ingesting system data and automatically updating to provide the most precise look forward. That allows the utility to rethrow the adoption curve on demand." Forecasting is just the first step in distribution planning, Osterhaus said. Planners need to know the amount, location and timing of DERs over the 10 to 15-year planning period. To do that, LoadSEER links to the standard power flow modeling software used by utilities for hosting capacity analysis. LoadSEER is being used by PG&E, San Diego Gas and Electric (SDG&E), Hawaiian Electric Co. (HECO), and several other utilities. HECO Sr. VP Colton Ching emailed Utility Dive that LoadSEER is "a key component" of integrated grid planning. Most recently, HECO used it in "an agent-based, bottom-up distribution system level forecast of localized impacts that various levels of EV adoption would have," he said, as well as "to develop cost-effective ways to mitigate the future impacts of EV adoption." PG&E spokesperson Paul Doherty emailed that LoadSEER has enhanced forecasting and allocation of distribution-level loads and resources. Its geospatial analytics and hourly load profiles have improved planners' assessments of DER growth impacts, he added. SDG&E just started using LoadSEER but is already satisfied with its granular assessment of loads and resources, according to spokesperson Wes Jones. Osterhaus said LoadSEER's competitors provide individual consulting studies on DERs. "We've seen nobody [else] that takes our approach, which is a single dynamic platform with all DER technologies and all the factors that might affect their adoption, from the meter level up," he said. "Until you do that, you can't know the long-term forecast, because the technologies all interact with each other." While LoadSEER is already established at some major utilities, Clean Power Research's WattPlan Grid tool is set to give it a challenge. Clean Power Research (CPR) CEO Jeff Ressler said predicting DER adoption and its financial impacts has become significantly more complicated for utilities because of the number of people and technologies involved. "Customers make decisions largely independent of the utilities but utilities need to understand what customers are going to do because DER technologies have substantial grid impacts," Ressler told Utility Dive. The "legacy approach" to planning, using spreadsheets and one-time consulting studies, is out of date because things are changing so rapidly at both the customer adoption and utility ends, he added. "It offers no way to consider every customer individually or account for the correlation of adoption between different technologies." CPR and SMUD will implement the first use of WattPlan Grid in May. The objective is to make the bottom-up, cloud-based tool "scalable on-demand for all parts of the utility organization," said CPR Technical Product Manager Gavin Novotny. WattPlan Grid will give SMUD three key outputs. The tool estimates the propensity for DER adoption for each customer based on economic, demographic, and psychographic data. Load impacts, starting at the individual customer level and going up to the system level, are aimed at planners. Revenue impacts of the forecasts are aimed at utility executives. "The probability to adopt, in and of itself, is an important output, but we take that a step further and provide load impacts and revenue impacts," Novotny told Utility Dive. "We're also giving them a dynamic interface to empower better decision-making." WattPlan Grid is moving into the space filled by LoadSEER and offers some “critical" newer capabilities, Novotny said. It can assess the specific technical potentials of individual customer DER systems, which gives feeder-level adoption forecasts greater substance. Like LoadSEER, CPR also offers the innovation that most interested LBNL's Mills. "It shows how the adoption forecast for any one particular technology affects the adoption of other technologies," Novotny said. "For instance, the optimal sizing of a rooftop solar system changes, depending upon whether a customer already has an EV." SMUD Program Planner Patrick McCoy said forecasting DER adoption allows the utility to understand load shape changes and planning "is all about the load shape and how it changes." WattPlan Grid's machine learning capability will also "learn" from utility data continuously uploaded to it from SMUD's other CPR software-as-a-service tools, McCoy said. WattPlan Advisor reveals customer interest in DER, PowerClerk shows where systems are interconnected, and SolarAnywhere helps predict actual solar production. "The algorithm learns that a certain number of queries ... results in a certain number of purchases and interconnections recorded PowerClerk, and the amount of output shown by SolarAnywhere helps inform the forecast," McCoy said. SMUD’s McCoy said the tool will make utilities understand they need to think about the many and various customer data sets they need and how they can gather or acquire them. “Data privacy is essential,” he said. “But forecasting is much more than rates and revenues, it's also about customer engagement."